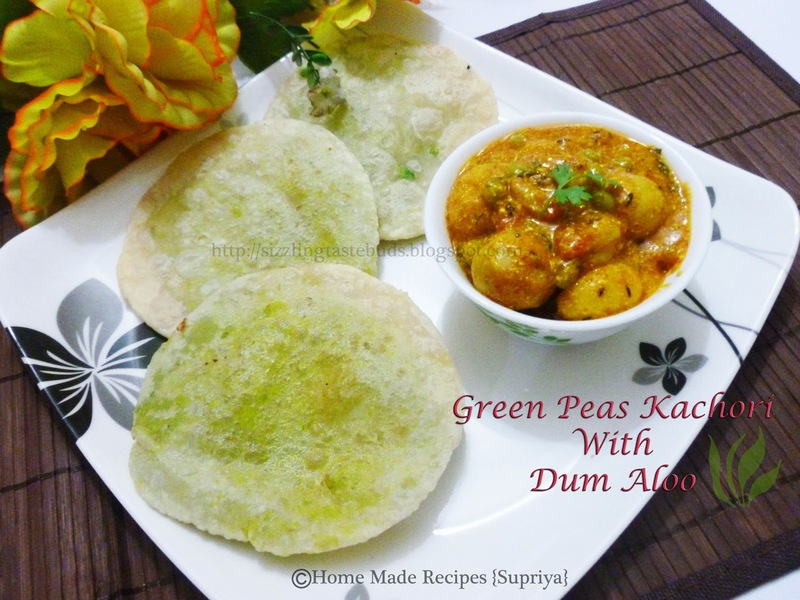 Green Peas kachori with Spicy Bengali Style Dum Aloo. This was the recipe challenge hosted by Sanoli for the South Indian Team from SNC in the month of February this year. I was not a part of this SNC group then. I saw lots of posts from my fellow bloggers with all praises for this dish and then I too joined it and tried it after a couple of months. Forgot to post it then and now since SNC has completed its first year, this month is meant for celebration with the recipes which we missed it out. As my blogger friends suggested, I too would like to join them and suggest all of you to give this dish a try. The best combo recipe - Green Peas Kachori with Spicy Bengali Style Dum Aloo. 1. Soak green peas for 4-5 hours. 2. Grind green peas along with green chillies to a coarse paste adding few drops of water. Make sure the mixture doesnot turn out to be smooth. Set aside. 3. Heat 1 tbsp ghee or oil in a wok and add Hing and the green peas paste to it. Mix well. 4. Now drop in ginger paste, cumin powder, sugar and salt to taste. Keep stirring and make the mixture thick enough for the filling. Remove it from heat and set aside. 1. Knead maida with salt, 2 tbsp oil and enough water to make a smooth dough. 2. Make small balls from this dough and also from the peas mixture. 3. Dust a small maida ball with some maida flour and flatten it with a rolling pin. Stuff this with a green peas mixture ball and seal the edges just the way we do for paratha's. 4. Dust this again with some more maida and flatten it again with a rolling pin giving it a kachori shape. 5. Work on rest of the maida balls and keep the kachori's ready for frying. 6. Heat oil for deep frying in a wok. 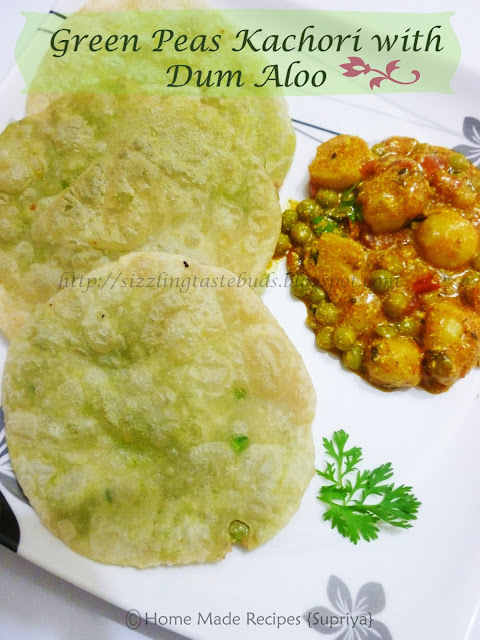 Add a kachori and fry till slightly brown and place it on an absorbent paper. Continue frying the rest of the kachori's. 1. Wash, boil and peel the baby potatoes. 2. Heat oil in a wok and fry the potatoes till golden in color. Keep aside. 3. Heat 2 tbsp oil. Add in bay leaf, hing, cumin seeds and fennel seeds. Saute it for few seconds. 4. Add boiled green peas and chopped tomatoes. Mix it well and cook till tomatoes become soft. 5. Now add in all the dry spices and ginger- garlic paste mentioned in the ingredients part along with salt to taste. Mix all together and cook till oil separates from the masala. 6. Add fried potatoes, sugar and sour curds. Mix well and add 1/4 cup of water. 7. Cook for another 4-5 minutes. Add chopped fresh coriander leaves and switch off the heat. Serve this hot with green peas kachori. A lovely, delicious combo - a must try recipe. 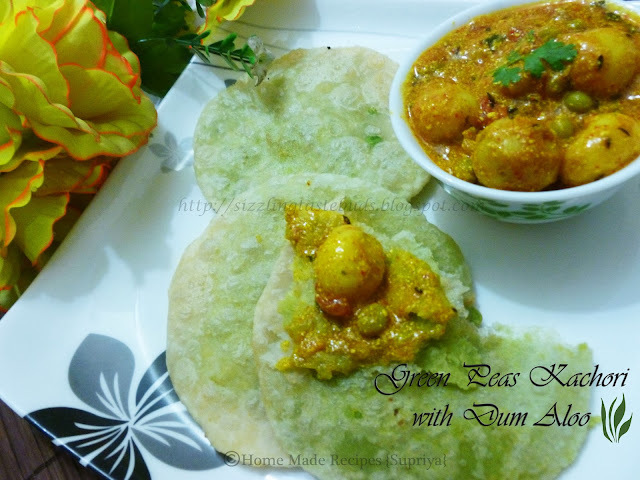 Absolutely delicious peas kachori with dum aloo. You gave full justice with this recipe. Thanks a lot for mentioning me and for your wonderful words.